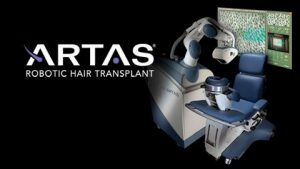 The ARTAS Robotic Hair Transplant System can take much of the stress out of hair restoration because it uses advanced digital imaging and precision robotics to improve the speed and accuracy of your FUE hair transplant procedure. When you seek the care of a hair restoration specialist in the Long Island, Queens or Brooklyn areas, there are a few key steps that can help you plan for a successful hair transplant with ARTAS. Most importantly, you will need to cut your hair before the ARTAS procedure, because trimmed hair is more accurately pinpointed and harvested by the robotic system. Your pre-transplant consultation will provide you with trimming instructions so that you are ready on the day of your procedure. You will not need to prepare for a long recovery since most patients only have mild swelling or pain if any symptoms arise at all following the transplant. Patients typically resume normal activities within 1-2 days, though you should allow for about 4-8 hours of treatment time, depending on how much hair is being transplanted.